German Chancellor Angela Merkel’s Christian Democratic Union (CDU) may have won a majority in September’s federal election, but that does not directly implicate that Germany’s future is clearly given. What emerges as Merkel seeks to form a new coalition with the Greens and the Free Democrats will not only shape Germany’s economic trajectory over the next four years, but it will also determine the fate of the country’s transformation into a truly open society. Germany has emerged as a global economic powerhouse in the European panorama in less than a generation, but the truth is that its current economic success is less the result of good policies than of favourable external conditions, especially in Europe, which ensured strong demand for German exports. Important domestic economic reforms enabled the country to take advantage of external demand, but they were undertaken long before Merkel came to power, and few meaningful ones have been implemented during her 12-year tenure. It is to say that Angela Merkel has been the first woman to cover the post of Chancellor of Germany and the second to chair the G8, after Margaret Thatcher, indeed she is considered by Forbes Magazine “the most powerful woman in the world”, but things cannot continue as usual. Germany is facing serious economic challenges and the new government should address them appropriately, also in the light of Macron’s upending of the European status quo, though the calling for a common EU defence fund, tax harmonization, and a joint Eurozone budget. Among all, the first challenge that Germany is facing is digitalization: some are calling for a nation-wide fiber-optic network and many fear the sharing economy (they are worried about firms such as Uber and Airbnb), but policy makers should resist the lobbying. This kind of investments should take place only where it is needed, not everywhere, and regulation should not inhibit innovative and also profitable business models. This advent of technology should not make fears of job losses due to automation and calls for an unconditional universal basic income prevail. This would mean we give up on parts of the population and surrender to unemployment. On the other hand, Germany should focus instead on training for the job opportunities of the future. Already the country’s ageing population is putting upward pressure on welfare costs; both major parties have ruled out raising the retirement age to 70. There are concerns about workers with physically demanding jobs, but these should be met through higher wages and disability insurance, not through public pensions. Secondly, globalization also constitutes a huge challenge: the country wants to attract companies and investment, as well as high-skilled immigrants. But redistributive taxation and welfare transfers are attracting low-skilled migrants and driving away investment and the high-skilled. Germany therefore needs to limit a tax burden caused by subsidies to the welfare state and it also need to limit access of new immigrants to social transfers. And here we come into another focal point: the new government’s program will likely reflect the suspicion that other EU member states want to solve their problems with German money rather than domestic reforms. German politicians and opinion makers assess that virtually every proposal for EU-level reform through this distributional prism. Schemes that are not intended to result in structural transfers are routinely dissected to confirm that they will not become cash dispensers for other EU members. And that’s true, since Germans regard a joint budget not as a way to finance public goods such as research or infrastructure, but as a device to compel Germany to cover other countries’ expenses. Similarly, common unemployment insurance is regarded as a scheme to make Germans pay for unemployed Spanish or French workers. And a deposit-guarantee program for banks is seen as a way to force prudent German depositors to pay for non-performing loans in Italy. And then, last but not least, there is climate change. As Germany pursues emission reduction, it should keep an eye on cost effectiveness. Some propose a ban on internal combustion engines after 2030, but it would be much better to include road traffic and a emission metring system. And at the same time, focusing on the Eurozone, it must be ensured that all the European banks hold fewer domestic government bonds that private creditors bear the burden of public debt restructuring, not taxpayers from other countries. The EU budget contains much to criticize, but it hardly treats Germany unfairly. Germany may be the largest net contributor, but that is because it has the largest economy. As a proportion of national income, countries like Belgium, France, and the Netherlands also contribute a meaningful share of their net income. Germany should not be obsessed with the fear of paying too much, because Europe needs countries that will veto half-baked proposals, which can overcome their narrow obsessions and provide leadership. 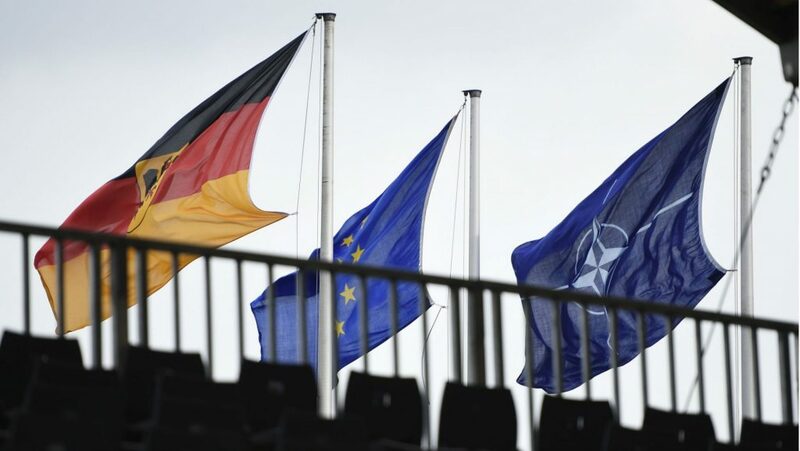 With the current coalition talks, German leaders have an opportunity to assess new global developments that will have far-reaching implications for Europe and Germany alike. They must decide whether it is riskier to do nothing, or to take the initiative.